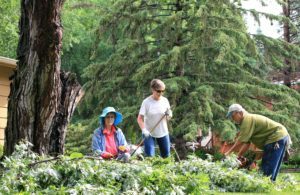 Friends and neighbors come together June 12 at the home of Judy Noble on Brookwood Lane in Sartell to help clean up storm debris. They are (left to right) Judy Noble, Lilly Lavigne and Richard Emslander. 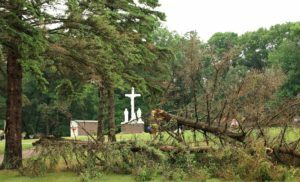 Two trees in the St. Francis Cemetery were downed during the June 11 windstorm. 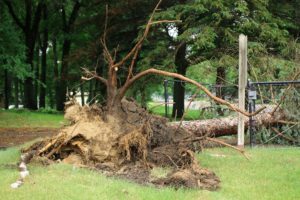 This mature pine tree in the St. Francis Cemetery was uprooted during the June 11 storm.